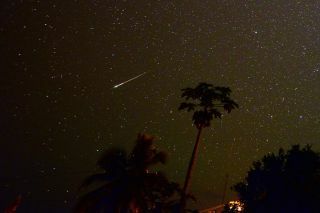 Astrophotographer Jim Denny took this photo of a Southern Delta Aquarid meteor on July 30, 2014, in Kekaha, Kauai, Hawaii. Every summer, skywatchers all over the world look forward to observing the famed Perseid meteor shower, but they often overlook some of the lesser displays that peak during late July and early August. This year, a waxing gibbous moon will seriously hamper Perseid watching, so why not take this opportunity to watch for the minor meteor showers during this upcoming week? The radiants of all the meteor showers we mention here will be reaching their highest points in the southern part of the sky between midnight and 4 a.m. local daylight time, at altitudes ranging between 15 and 30 degrees above the horizon. Capricornids — These meteors are already past their peak, which was predicted for July 26, but the shower extends from July 10 to Aug. 15. The radiant is crossing the meridian — the line connecting the point directly above an observer with the north and south celestial poles — around 1 a.m. local daylight time. And there will be little or no interference from the moon until the beginning of August, so conditions are now nearly ideal to look for these bright meteors. Only a few Capricornids will appear per hour, so most of the meteors seen will be sporadics, or members of another shower. Piscis Austrinids —This shower reaches its peak on July 31, though it's apparently active from July 15 to Aug. 20. By July 31, the moon will be eight days past new, setting just after 1 a.m. So morning watchers still have no worries; the radiant crosses the meridian at 2 a.m. This is a lesser stream; only about eight meteors per hour will be visible to observers in the Southern Hemisphere, where the radiant climbs high in the sky. Alpha Capricornids — This display begins on July 15, peaks on Aug. 2 and ends on Aug. 25. Moonset is at 2:30 a.m. The constellation of Capricornus is still well up in the south-southwest at that time. Though few in number, the Alpha Capricornids frequently produce bright yellow fireballs that can be quite spectacular. Iota Aquarids — This is another two-radiant shower with detectable members from July 15 to Aug. 25. At this shower's peak activity, on Aug. 6, the moon is practically full, leaving little time for observing. Only about six members per hour are seen under good conditions; the radiant reaches its highest point in the southern sky at 1 a.m.
Perseids — A waning gibbous moon (19 days old) will dominate morning skies on Aug. 12, spoiling the peak of this year's Perseid shower. The radiant for this display is not too far from the famous double star cluster of Perseus, which rises out of the northeast during the mid-evening hours and reaches a point almost directly overhead just before 6 a.m. When the maximum occurs in a dark sky, this rich stream averages more than 50 meteors per hour, though double this rate has been seen on occasion. Many flaring meteors with trains are seen under good skies, but only the brightest of them will be visible in 2017. The Perseid shower normally extends from late July into the third week of August. We'll provide additional details in early August. Editor's note: If you have an amazing skywatching photo you'd like to share with Space.com and our news partners for a possible story or image gallery, please send your photos to our staff at spacephotos@space.com. Joe Rao serves as an instructor and guest lecturer at New York's Hayden Planetarium. He writes about astronomy for Natural History magazine, the Farmer's Almanac and other publications, and he is also an on-camera meteorologist for Verizon Fios1 News, based in Rye Brook, N.Y. Follow us @Spacedotcom, Facebook or Google+. Originally published on Space.com.